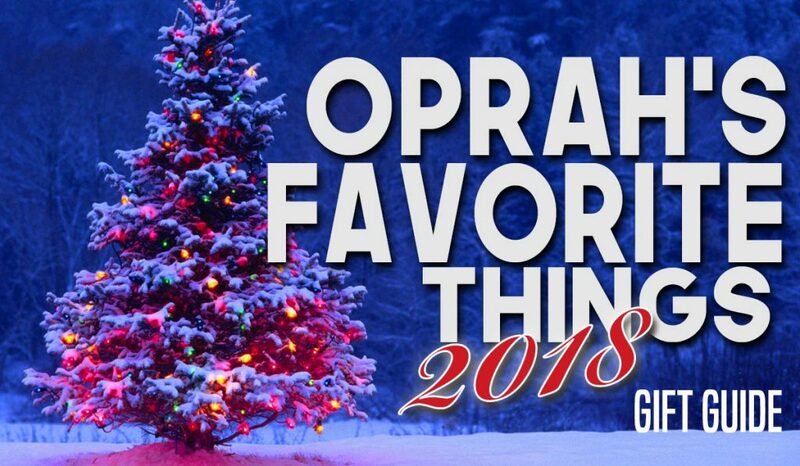 Oprah’s done it yet again this year with her “Oprah’s Favorite Things”, 2018 edition! As always, Oprah goes big, and she doesn’t disappoint with this huge Santa’s bag of goodies! … from hot cocoa mixes and spicy sauces on the one hand all the way up to foot massage machines, juicers, and a large flat-panel smart TV on the other. The entire list appears in the December issue of O Magazine but Amazon had it first right here so go check it out! Here are just seven (7) of the items we happen to like covering all price ranges and types of gifts! There are SOOO many more cool Oprah-esque gifts, so our sampling here merely scratches the surface. But it should be enough to make you want to check out the entire list. Legendary chef and artist Jacques Pépin brings you this gorgeous diary hand-illustrated with his wonderful art so you can capture in writing every detail of every dinner party you host. Line them up on a shelf in your kitchen or living room and these soy wax candles will fill your home with a splendid blended aroma: Rosemary, lavender, olive, geranium, and juniper. Ahhh! Meet Carl the Snowman… just like Frosty stuffed with delicate marshmallows! He’s a hunk of chocolate you put in heated milk and before you know it, decadent rich hot cocoa! Infused with extracts like apricot and honey tea and honeyed grapefruit (can you say WOW? ), these hydrating soap bars will pamper you to no end! Plus, these are ALL YOU if you love knowing where your body products come from… these come from a farm in upstate New York. Isn’t it fascinating knowing where you come from, your family ancestry? It’s equally as fascinating knowing this about your fur babies too! This test reveals a dog’s genetic age and info, as well as breed breakdown, from a small sample of slobber. This doggie DNA Test kit is absolutely amazing! Sized to match lasagna noodles, these pans will come in super handy when you have to make more than one variety like all veggie or gluten-free or meat-lovers meals! It’s the latest Echo device from Amazon. Very similar to its older brother – the Alexa – it understands voice commands, sports a sleek screen and camera, and packs it all in a smaller, more compact package! See Oprah's entire list now! There are no other posts in this category.